ELVINETTE® | Know Your Contraceptives - Consilient Health Ltd.
What is ELVINETTE® & what is it used for? ELVINETTER is a contraceptive pill and is used to prevent pregnancy. Each tablet contains a small amount of two different female hormones, namely drospirenone and ethinylestradiol. Your contraceptive pill acts in various ways to prevent pregnancy; most importantly it works to prevent egg release. ELVINETTE® comes in strips of 21 pills, each marked with a day of the week. Start taking your next strip of ELVINETTE® after the seven pill-free days – even if you are still bleeding. Always start the new strip on time. What if I forget to take ELVINETTE®? If you are less than 12 hours late taking a tablet, protection against pregnancy is not reduced. Take the tablet as soon as you remember and then take the following tablets again at the usual time. If you are more than 12 hours late taking a tablet, protection against pregnancy may be reduced. The greater the number of tablets that you have forgotten, the greater is the risk of becoming pregnant. The risk of incomplete protection against pregnancy is greatest if you forget a tablet at the beginning or at the end of the strip. What if I vomit or have severe diarrhoea after taking ELVINETTE®? If you vomit or you have severe diarrhoea within 3-4 hoursof taking a tablet, there is a risk that the active substances in the pill will not be fully taken up by your body. I was previously on Yasminelle® and have now been changed to ELVINETTE® – what is the difference? There is very little difference between these pills as they both contain exactly the same active ingredients in the same quantities, but they are made by different manufacturers and therefore have different names. ELVINETTE® contains soya oil. If you are allergic to peanuts or soya you should not use this product. What if I miss a dose of ELVINETTE®? If you miss a pill, follow the missed pill guidance or review the Patient Information Leaflet contained inside every pack of ELVINETTE®. If you miss more than one pill ask your doctor, nurse or pharmacist for advice. If you have been sick within 3-4 hours after taking your pill or you have severe diarrhoea, your body may not get its usual dose of hormones from that pill. After vomiting or diarrhoea, take another pill from a reserve strip as soon as possible. If possible take it within 12 hours of when you normally take your pill. If that is not possible or 12 hours or more have passed, you should follow the advice given for missing a pill. Like all medicines ELVINETTE® may cause side effects, although not everybody gets them. Common side effects include depressive mood, headache, migraine, nausea, breast pain, tenderness, menstrual disorders, bleeding between periods, thick whitish vaginal discharge and vaginal yeast infection. If you get side effects, including any possible side effects not listed above, talk to your doctor or pharmacist. Am I likely to develop a blood clot if I take ELVINETTE®? The use of any combined oral contraceptive pill increases your risk of developing a blood clot compared with women who do not take any contraceptive pill. If you notice any of the signs below, stop taking your pill and contact your doctor immediately. Some medicines may stop your pill from working properly and mean that you need to take extra contraceptive precautions. These include antibiotics, St John’s Wort and medicines to treat epilepsy, tuberculosis, HIV and fungal infections. Your pill may also stop other medicines from working properly such as ciclosporin, (an immunosuppressant) and lamotrigine (to treat epilepsy). Your doctor or pharmacist will advise you if you are unsure about taking other medicines in combination with ELVINETTE®. Breast cancer has been observed slightly more often in women using combined oral contraceptive pills, but it is not known whether this is caused by the treatment. For example, it may be that more tumours are detected in women on combined oral contraceptive pills because they are examined by their doctors more often. The risk of breast cancer gradually reduces after stopping combined oral contraceptives. 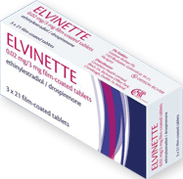 If taken correctly, ELVINETTE® is an effective, reversible form of contraception. ELVINETTE® will not protect you against sexually transmitted diseases. Only condoms can help to do this. IE/OCS/0817/0057d Date of preparation: July 2018.